Jennifer When we woke up Saturday morning in Stockholm, it was sunny and clear, just right for a sit in a park, which had been one of my chief ambitions for the weekend. 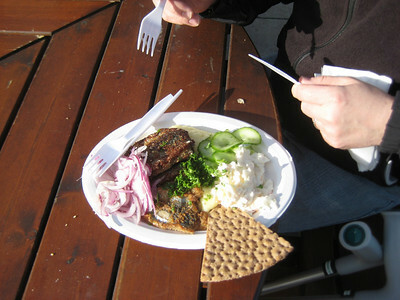 After a slightly less leisurely breakfast than we had had on Friday, Joe took off to run an errand, and I packed up a mid-morning snack and headed down to the nearest good-sized park, called Nytorget, only two blocks away. 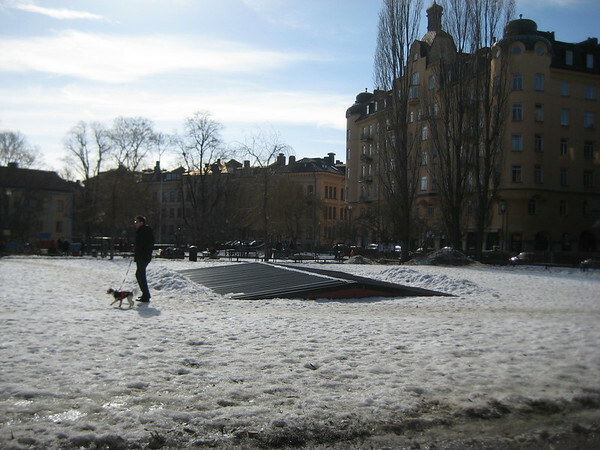 Outdoor seating at the cafes lining the square were at a premium, but there were plenty of spaces on the benches in the square, where I sat and ate my leftover pizza and watched the dog walkers and kids playing in the melting snow. I walked around the area a little bit, then met Joe on the bus, and we headed back into town for an afternoon of touristing. 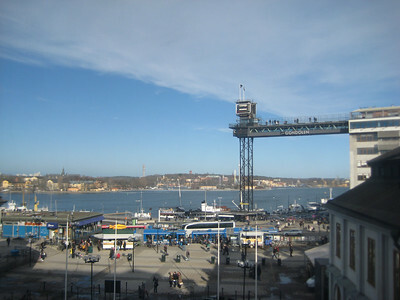 When the museum closed at 5pm, it was still plenty light and sunny, so we decided to take an elevator up to the pedestrian bridge at Katarinahissen—the famous elevator itself was out of service, but there is a perfectly good one (and free!) in the nearby office building. The views of the city are as good as advertised—and a great view of the Museum we were just in— and it's rather fun to watch the traffic at Slussen, which can probably be fairly said to be Sweden's major interchange. We walked along the pedestrian bridge back to the cliffs of Södermalm, alternately envying and feeling sorry for the apartment dwellers with balconies facing the walkway—great views of the city and lake, but you would have tourists looking at you all the time! The area at the top of the bridge has a large theater that faces the lake to the north and a little square, Mosebacke Torg, to the south: we lingered in the square to watch the dressed-up people stream out from an early show. The square is probably quite charming in the summer, when the fountain has (unfrozen) water in it, and there are narrow streets running out of it, all leading downhill. Crêperie Fyra Knop, which is one of the restaurants we had thought might be suitable for our big dinner out, is in this area, so we thought we'd just drop in and have dinner. We are, ahem, a little out of practice with this big city restaurant stuff... the hostess looked quite dubious when we said we had not booked a table, but they keep a spare table near the door, apparently in case some silly people like us wander off the street at 7pm, on a Saturday night, at one of the most popular eateries around... sheesh! (We got in just in the nick, too; lots of other people came in after us and got flatly turned down.) 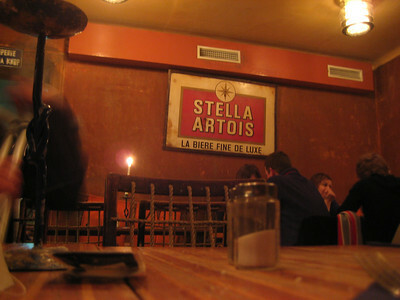 The place is cozy and warm, and the food was delicious (no good food pictures because it was a little dimly lit)— we each had crepes with salmon, mine with potatoes and herbs and raclette, Joe's was with garlic-sauteed spinach and roquefort. 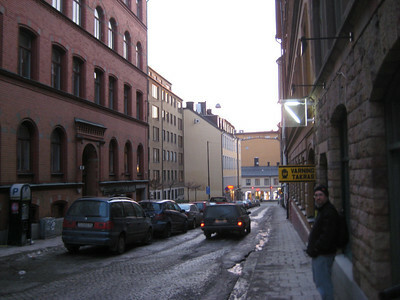 After dinner we took a slow amble back down Svartensgatan and then Götgatan, stopping to peer in the windows of the shops and bars. We took the bus back to our home base, stopped in one of the numerous local cafes for a latte and a nibble of dessert, then back to the apartment to relax and recover from a long day of tramping around. As an extra luxury, we rented a movie, and watched it on a television.